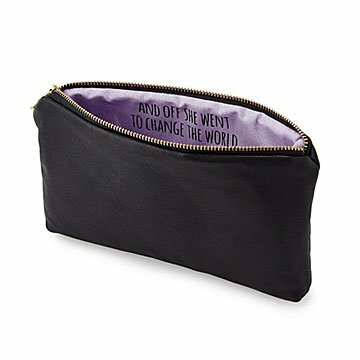 Unzip this leather-alternative pouch to find a message of love printed inside. It's what's on the inside that counts. Unzip this leather-alternative pouch to find a loving message printed on the cotton lining. It's just the right size for storing cosmetics, stowing in a weekend bag, or keeping your everyday tote organized—all with a personal touch. Customize the color inside to make it an extra special gift for your sister, mother, wedding party (preview of the bridesmaid dress color, perhaps? ), or keep it all for yourself—we could all use a little inspirational message now and then. Handmade by Sandra Smith in New York. Sandra Smith is interested in getting to the heart of common objects—transforming simple, everyday pieces into something more meaningful with motivational messages and other special details. Sandra’s passion for creating art has been lifelong, and her natural entrepreneurial spirit made for quick success at turning her creations into a business. That success gave Sandra the confidence to break her silence on a difficult topic: her personal struggles with intimate partner violence. Since then, she has been an advocate for domestic abuse awareness. Being soft and strong are not mutually exclusive—Sandra proves it. This pouch's leather is so much softer than I expected. The inside printing is so well done, it was well worth the cost!! I know my niece will get plenty of use out of this. I want to buy this bag for everyone I love. I know that each time my granddaughter open this bag she will think of me and be inspired.